Years ago I was called in to assist a well known and respected quarter horse trainer with a mare he was having trouble with. When I arrived at the ranch, we walked over to her stall and I introduced myself. He went on to explain that she just didn’t seem to understand what he wanted her to do. He’d worked with her for several months now and wasn’t getting anywhere. Although he was very patient and careful to explain things, he’d begun to wonder if she was in pain. Or maybe she was -slow in the head or maybe she was just in the wrong line of work – even though she had all the genetics she needed for the job. He felt he’d tried everything he knew from his many years of working with horses, but was well and truly stumped. As a last resort, he’d asked me to communicate with her to see what was wrong. If that didn’t help turn things around, he was going to have to give up and send her back to her owner. When I asked her what was going on, she told me something very surprising and unexpected. She said that she had no intention of working with him because he was disrespecting her and was rude. He had no idea who she really was and she would not work for him because of it. I thanked her for sharing that with me and asked her to please explain to me how he was being rude to her. She said that he called her ‘Rat’ and that her true name was Wind Dancer. Rat was rude and disrespectful and she wouldn’t answer to it, in fact, it made her mad. She even demonstrated her annoyance by trying to bite at him and even kicked in our direction! When I shared that with my client, he turned a nice shade of red in embarrassment as he confirmed what she’d said, he did call her Rat! He exclaimed, “I can’t call her that! Everyone would laugh at me! Cutting horse people just don’t name their horses things like “Wind Dancer! I tried to explain to her how he felt and asked her if we could somehow find a compromise to work this out.She said it would be ok if he called her Windy, as long as he KNEW he was actually calling her Wind Dancer, but just saying Windy for short. He said he thought that would be ok, and she came over for a head rub as she visibly calmed down. A couple of weeks later, I checked in with him and asked how she was doing.Apparently, as soon as they got things straight between them, she settled down to her work and became quite a good cow horse very quickly.It was never the work she minded, just the attitude. Have you ever felt that the name you are calling your animal friend is somehow not right, or doesn’t fit them, or noticed that they didn’t respond to it? Maybe you’ve got the wrong name. You may not know it but animals do occasionally change their names. Different cultures traditionally have allowed individuals to earn a new name during rites of passage or in vision quests. Animals also can choose different aspects of themselves to embrace at different times of their lives as they mature or go through phases. It’s not uncommon for a shelter animal to want a new name when they go to a new home or choose a new family. I recently worked with a client who wanted to invite a new dog into her life (after her older dog gave his approval and support for the idea which is always a good thing to do, of course). So I helped them work with the first few dogs, who all turned out to not be right for them at all. The next dog they attracted felt really wonderful even though she had some problems. A shelter foster dog, she came to them with the name of Sophie, but my client just got the sense that wasn’t her real name. So she kept asking and trying different names. Nothing worked until one day she heard a name pop into her head. Penny! My name is Penny! When she tried that name with the new dog, she immediately got an enthusiastic response which proved to her without a doubt what her new friend wanted to be called. There are many other critically important reasons to talk with your animal too, especially if you are considering taking in a new companion. For instance, only they can tell you their true history and background. Who else will know but them, right? Communicating also helps them understand new house rules, and provides an opportunity to negotiate behavior. We also need to know about their training background, their learning styles, what they feel their purpose is, what they like or don’t like. You’ll also want to know if they feel there is a good fit between you. Please don’t take on an animal just because they are cute or remind you of an animal you had before. If they don’t feel connected to you, then regardless of how hard you try, neither of you will be truly happy together. 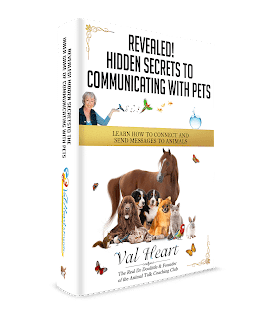 Communication with animals also helps them heal from past trauma or abuse, eases the transition time, and supports them while they grieve the loss of the family they lost. So do yourself and your animal friends a favor and give them a voice. You’ll be glad you did. I would love to hear your story of how your beloved animal friend came by his/her name! Leave me a comment below!! Nice story and really true. I think there is also a basic rule in the fact, that we treat animals in the way we call her name. We treat an animal more rude when we call “rat”. I have a horse, her name is Pretty Woman, and she is acting like a princess ;-), I know other horse having names like “que belle”, or Diva, it’s the same. They show themeselves like a princess, or a Diva. So always take care on the name you call your animal ..